All mixing sessions at Online Studios include one of our highly skilled engineers who will carefully analyse your project and provide optimum levels, EQ & settings of instruments, vocals, and sounds. If needed we can offer our creative input and help you select the right processes and effects that will work with your mix. With mixing almost every project is unique, so we are on hand to advise you what is needed. You will be provided with your Final Mix files as a 16bit 44.1kHz WAV (CD use) and a 320 kbps MP3 (Digital use). Additional formats and sample rates can also be provided. Online (Unattended) Mixing includes free secure uploading & digital delivery of your Mixed file links direct to your email address. 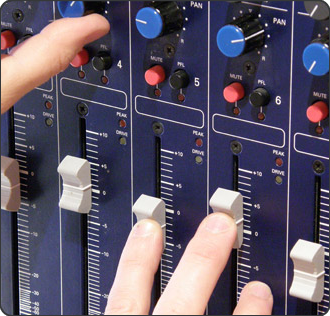 Turnaround for Online Mixing is usually within 2 to 3 working days, for urgent jobs please call us.